Excerpt from Wikipedia: Laozi (Chinese: 老子; pinyin: Lǎozǐ; Wade-Giles: Laosi; also Lao Tse, Lao Tu, Lao-Tzu, Lao-Tsu, Laotze, Lao Zi, Laocius, and other variations) was a philosopher of ancient China and is a central figure in Taoism (also spelled “Daoism“). Laozi literally means “Old Master” and is generally considered an honorific. Laozi is revered as a deity in most religious forms of Taoism. 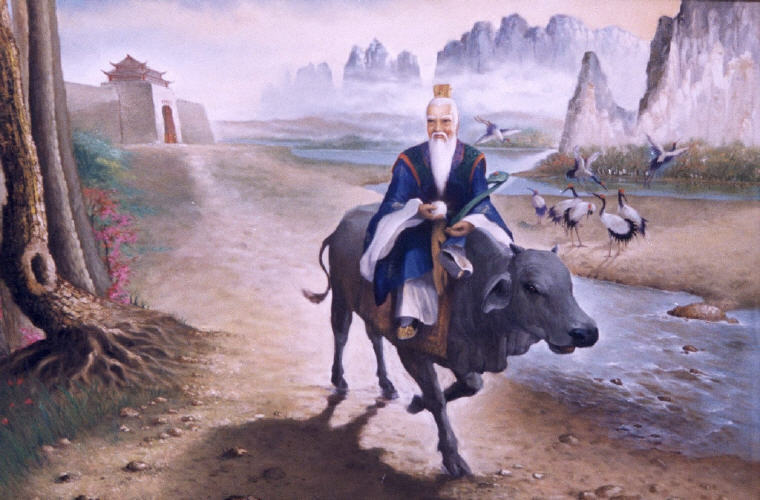 Taishang Laojun is a title for Laozi in the Taoist religion, which refers to him as “One of the Three Pure Ones”. 2. A journey of a thousand miles begin with a single step. 3. By letting it go it all gets done. The world is won by those who let it go. But when you try and try, the world is beyond the winning. 4. He who knows does not speak; he who speaks does not know. 5. Knowing others is intelligence; knowing yourself is true wisdom. Mastering others is strength; mastering yourself is true power. 6. The sage has no possessions, the more he does for others, the more he has; the more he gives to others, the more he receives. 7. One who knows what is enough, will always have enough. 8. One who is contented knows no shame, one who knows when to stop is free from danger, long live shall he. 9. Who can patiently wait till mud settles and water is clear? Who can sit still till the right action arises by itself? 10. Fill your bowl to the brim and it will spill. Keep sharpening your knife and it cannot preserve its sharpness for long. 11. Good deed, leaves no traces; good speech, without reproaches; good plan, needs no plotting; good door, needs no lock, yet cannot be open; good binding requires no knots, yet cannot be untie. 12. Since wind does not last the whole morning, shower does not last the whole day. Why is this so? Heaven and Earth cannot make things eternal, let alone man? 13. Governing a nation is like frying a small fish. Center your country in the Tao and evil will have no power. Not that it isn’t there, but you’ll be able to step out of its way. Give evil nothing to oppose and it will disappear by itself. 14. Anticipates things that are difficult while they are easy, and does things that would become great while they are small. All difficult things in the world are sure to arise from a previous state in which they were easy, and all great things from one in which they were small. Therefore the sage, while he never does what is great, is able on that account to accomplish the greatest things. 15. One who is contented is rich, one who perseveres has aspiration, one who stays where he is endures, one who dies and is not forgotten lives on. 16. Empty your mind of all thoughts; be at peace. Observe the processes of all things. They flourish and then return to the root, to stillness; the way of nature. Not knowing this, disaster arises. Knowing this one will be tolerant. Tolerant means openness, openness means kingliness of character, kingliness means heavenly, heavenly means the Tao, Tao means everlasting, without form, cannot perish. 17. Therefore the sage said: When I am not biased and the people are reformed on their own, when I enjoy peace and the people are righteous on their own, when I do not create trouble and the people naturally prosperous, when I have no desire and the people live simple. 18. Fame and Life which is more dear to you? Life and wealth which is more vital? Attaining fame and wealth and losing life which is more harmful? Therefore, intense attachment brings sufferings; more possession brings danger. 19. Arms, are instruments of fear, not instruments of the superior man. Wielded only when inevitable, peace is paramount, there is no rejoice in victory as such; to rejoice, is to delight in the slaughter of men. 20. I have three treasures, which I prize and hold fast. First is compassion, second is simplicity, third is humility. Compassion, therefore I can be courageous; simplicity, therefore I can be generous; humility, therefore I can be good. 21. All in the world know beauty only because of ugliness; they know good only because of bad. 22. If you do not change direction, you may end up where you are heading. 23. If you realize that all things change, there is nothing you will try to hold on to. If you are not afraid of dying, there is nothing you cannot achieve. 24. If you would take, you must first give, this is the beginning of intelligence. 25. In dwelling, live close to the ground. In thinking, keep to the simple. In conflict, be fair and generous. In governing, don’t try to control. In work, do what you enjoy. In family life, be completely present. 26. One can not reflect in streaming water. Only those who know internal peace can give it to others. 27. One who is too insistent on his own views, finds few to agree with him. 28. If you want to awaken all of humanity, then awaken all of yourself, if you want to eliminate the suffering in the world, then eliminate all that is negative in yourself. Truly, the greatest gift you have to give is that of your own self-transformation. 29. If you correct your mind, the rest of your life will fall into place. 30. People in their handlings of affairs often fail when they are about to succeed. If one remains as careful at the end as he was at the beginning, there will be no failure. 31. The higher the sun ariseth, the less shadow doth he cast; even so the greater is the goodness, the less doth it covet praise; yet cannot avoid its rewards in honours. 32. A scholar who cherishes the love of comfort is not fit to be deemed a scholar. 33. At the center of your being you have the answer; you know who you are and you know what you want. 34. To know yet to think that one does not know is best; Not to know yet to think that one knows will lead to difficulty. 35. To see things in the seed, that is genius. 36. Treat those who are good with goodness, and also treat those who are not good with goodness. Thus goodness is attained. Be honest to those who are honest, and be also honest to those who are not honest. Thus honesty is attained. 37. When I let go of what I am, I become what I might be. 38. When you are content to be simply yourself and don’t compare or compete, everybody will respect you. 39. If a person seems wicked, do not cast him away. Awaken him with your words, elevate him with your deeds, repay his injury with your kindness. Do not cast him away; cast away his wickedness. 40. Life is a series of natural and spontaneous changes. Don’t resist them; that only creates sorrow. Let reality be reality. Let things flow naturally forward in whatever way they like. 41. Nature does not hurry, yet everything is accomplished. 42. If you are depressed, you are living in the past. If you are anxious, you are living in the future. If you are at peace, you are living in the present. 43. A man with outward courage dares to die; a man with inner courage dares to live. 44. Because one believes in oneself, one doesn’t try to convince others. Because one is content with oneself, one doesn’t need others’ approval. Because one accepts oneself, the whole world accepts him or her. 45. Watch your thoughts; they become words. Watch your words; they become actions. Watch your actions; they become habit. Watch your habits; they become character. Watch your character; it becomes your destiny. 46. What the caterpillar calls the end, the rest of the world calls a butterfly. 47. Your own positive future begins in this moment. All you have is right now. Every goal is possible from here.